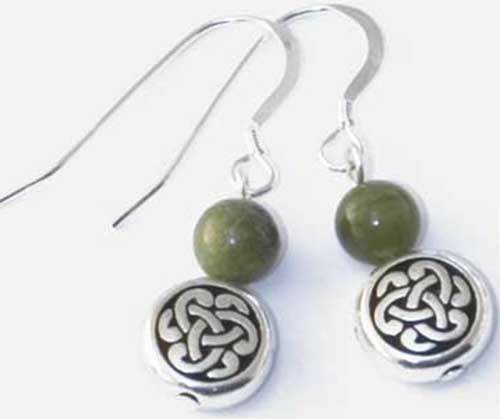 Connemara marble earrings, with sterling silver fish hooks, are enhanced with pewter beads that feature Celtic knots. These Celtic earrings feature 6mm Connemara marble beads that are enhanced with silver plated over pewter Celtic beads with oxidized accenting. The Connemara marble earrings are a drop style with sterling silver fish hooks that measure 3/8" wide by 1 1/4" tall to the top of the wire. Connemara marble necklace is enhanced with silver plated over pewter Celtic knot charms. Connemara marble bracelet is enhanced with silver plated over pewter beads that feature Celtic knot-work.